Welcome to the People's Airport St.Gallen-Altenrhein! Our Airport is located in Eastern Switzerland directly at Lake Constance, bordering with the countries Austria, Germany and the Principality of Liechtenstein. It has fast connections to the motorway, economically important regions such as Bregenz, Vaduz and St.Gallen and the well-known skiing resorts Lech, Zürs, Klosters und Davos. 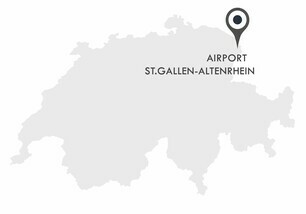 The Airport St.Gallen-Altenrhein is operator (FBO) and handling agent. It offers smooth processes, shortest ways and highest comfort in customer service. Everything for your well-being here in Altenrhein. We provide tailor made handling services. Information on Safety and Security. Live images and time-laps LSZR. Altenrhein, the preferred and closest airport to Davos. Do you have any questions? Get in touch with our team.